New Zealander Danny Gibbs will be Illingworth CC’s overseas amateur for 2015. The 21-year-old will be hoping to help the Aire Wharfe League side keep up the good work following last year’s promotion from the bottom section. Gibbs is the player/coach of Gisborne Boys High School and represents Poverty Bay and formerly Waikato University. He is set to play for a Northern Districts Invitational XI versus Zimbabwe as part of their World Cup warm up. He opens the batting and bowls off spin. “I’m really looking forward to getting across to England and meeting the lads,” he said. Gibbs arrives in early April and will be travelling with his girlfriend Amanda. He will be involved in the coaching set up at the club and will visit local schools as part of the club’s successful link with the community. The club has also signed a new shirt sponsorship deal with the Regional Cask Ale Brewer Moorhouse’s. 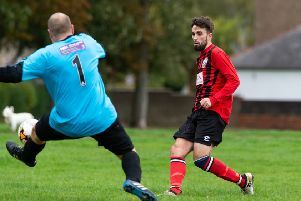 Its link up with new Haslem-Sheppard Halifax AFC side Illingworth St Mary’s, who are top of Division Two, is going from strength to strength. The football team use the new 3G pitch at Trinity Academy but use the cricket club’s facilities before and after matches. Illingworth start their fixtures on April 19 with the firsts making the trip to Knaresborough. The club will again be running three senior teams and five junior teams from under nines through to under 17s. The seniors have just started winter nets at the Cricket Asylum in Sowerby Bridge on Tuesday evenings from 8.30 until 9.30pm. The juniors start their nets on Wednesday evenings from February 11 between 5.30 and 7.00pm at Trinity Academy, Holmfield. Qualified coaches will be on hand. The club extends an open invitation to anyone who would like to play and anyone wanting more information should ring 07979-645379.